Looking for a professional sign that makes your company stand out to clients? Look no further than our Light Up Aluminium signs. The first impression that people get of your company is from the outside of the building. Before your client has even approached the door it is important that you present your company professionally. If you are located in a row of buildings it is also important to make it clear which is your company and set a good first impression. Our Light Up aluminium signs offer the perfect choice and can be customised with your company logo. 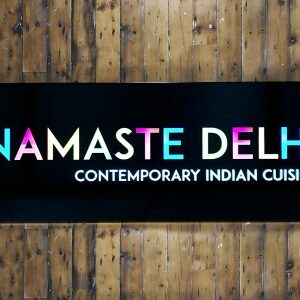 Our illuminated aluminium signs are made from a single piece of aluminium panel that is folded into a tray. These are then braced and riveted to ensure a long lasting finish. The letters and logo are then routed out and backed with an opaque acrylic panel. 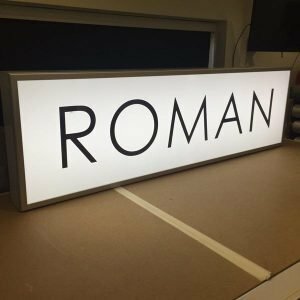 Inside the aluminium tray we use high lumen LEDs to shine through the acrylic and give the sign a stylish backlit effect. We offer a free design service to assist you and make sure that you get the perfect sign to meet your needs. 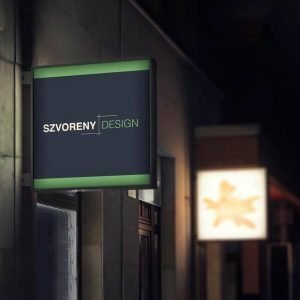 It is important to get your sign right as it is usually the first impression clients will get, so we want to assist in the process and make sure you get a great LED sign you are happy with. -Professionally routed text. Clear and clean text to distinguish your company. -Folded Alupanel Composite. Strong and durable for a long lasting sign. We only use the highest quality materials and machinery to produce our signs and banners, which is why all of our signs carry a 12 month warranty for your peace of mind. You can also rest assured that you are getting the best price, with our price matching service. If you find another product of the same quality for less, we will match the price.